We checked back in with the popular teen as he headed to his senior prom Friday night. WARMINSTER, Pa. (WPVI) -- A popular Bucks County teen's personality and charisma made him an internet sensation. We first met Nick McGee when he was voted homecoming king at Central Bucks South High School this past fall. We checked back in with the popular teen, who has Down syndrome, as he headed to his senior prom Friday night, and he couldn't be more fired up about it. Nick and his friend, Cara Cushing, were looking spiffy for the prom and posing for tons of pictures for family and friends. Nick even got down on bended knee and handed Cara a bouquet of roses. Ah yes, Nick's a real gentleman, and you could say a bit of a ham. 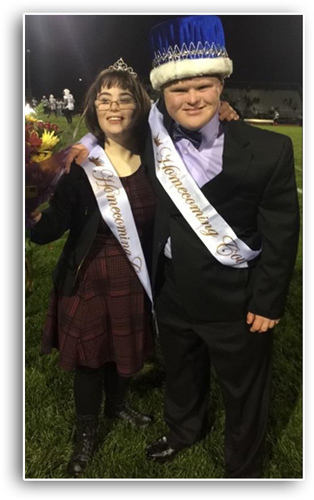 Known for his enthusiasm and spirit, 18-year-old Nick along with Lily Bowman were crowned homecoming king and queen at CB South back in the fall. They won by a landslide vote and became internet sensations. He invited his lifelong friend, 16-year-old Cara, to his senior prom and she accepted. The couple's families are gratified that their friends at CB South have embraced Nick and Cara, not as classmates with Down syndrome, but simply as classmates. Nick's mom, Kim McGee, tells us, "He is happy, he just loves CB South and all his friends and he's just excited for the night." And Cara's dad, Mike Cushing, says, "One of the things I hope for is that it gets to the point where this isn't considered like a special event, it's normal, it's expected." Our cameras captured the moment everyone had been waiting for. Their dream come true - their first dance at the prom. Kim says, "He asked Cara to the prom and he's going to the prom and he's gonna be with all his friends. So, I feel as like there's a lot of normalcy in his life. It's a good feeling." A special moment and a special night indeed.